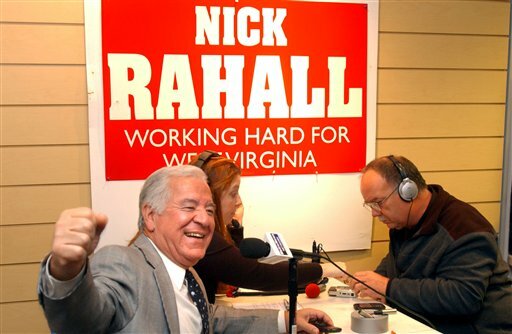 Rahall and coal: What’s a W.Va. congressman to do? June 7, 2012 by Ken Ward Jr.
My own experience with Rep. Nick J. Rahall is that he’s a kind, patient and — above all — very gracious man. Rep. Rahall has gone out of his way to give me tons of time for interviews, even though he probably knew the questions weren’t going to be especially easy and the resulting story might not be what politicians consider positive coverage. So it’s been a bit troubling to hear stories of how some constituents have been treated in recent years when they’ve tried to convince Rep. Rahall that he is wrong to be such a staunch supporter and defender of mountaintop removal. If you watched any of the video stream yesterday of the arrests made of anti-mountaintop removal activists in Rep. Rahall’s offices, what you saw was a politician whose become very defensive of his record and very angry with those who continue to question the direction his politics have gone. On the one hand, Rep. Rahall did give these young activists a half-hour meeting, even though they arrived without an appointment and were clearly part of some organized protest that was set up to end with peaceful civil disobedience arrests. Some of the “tweets” I saw from activist groups were a bit baffling, given that they were condemning Rep. Rahall not for his position on mountaintop removal, but for daring to think that once a meeting was over, people should leave his office so he could move on to other things (which in this case included meeting with the families of some of the miners who died in the Upper Big Branch Mine Disaster). The whole point of yesterday’s action was for some folks to get arrested, to it’s silly to complain when that actually happens. On the other hand, from what I saw, Rep. Rahall was reduced to complaining that these activists (including his constituents) were “too negative” or “too pessimistic” about West Virginia and its future, and about the coal industry. Rep. Rahall praised the development of the new Boy Scout Jamboree facility in Fayette County. But he apparently forgot that, in order to make that project work, the state had to spend a significant chunk of money cleaning up some of the coal industry’s messes. (And like most West Virginia political, business and media leaders, Rep. Rahall certainly wasn’t interested in saying anything about the incredibly discriminatory policies and practices of the Boy Scouts). What happened since the arrests in Rep. Rahall’s office, though, is especially interesting. Extolling the long-term economic benefits of Federal investments in energy research and development and basic infrastructure, U.S. Representative Nick Rahall (D-W.Va.) Wednesday voted in favor of the Fiscal Year 2013 Energy and Water Appropriations bill that included additional funding he requested for economic development and coal research programs in Appalachia. “Long-term investments in our economy and cleaner, cutting-edge coal technologies are critical to ensuring that the United States remains a competitive force in the global economy. We must continue pressing hard for these investments that will help to create new job opportunities in the region and provide a better future for our children and our children’s children,” said Rahall, who is the top Democrat on the House Transportation and Infrastructure Committee. The bill provides funding for the U.S. Department of Energy, the Appalachian Regional Commission (ARC), and related agencies throughout the coming fiscal year, which begins on October 1. Among other things, the bill restores funding levels that the President had proposed to cut for the Fossil Energy program for coal research, which underwrites the development of coal technologies to burn coal more cleanly and efficiently. Rahall also has supported the program’s work on Carbon Capture and Sequestration (CCS) because the ability to keep carbon emissions from entering the atmosphere is considered vital for the continued use of coal for power generation throughout the foreseeable future and for establishing coal-to-liquid (CTL) production on American shores. “Every time gas prices spike, we recognize the need to invest in cleaner, cutting-edge use of West Virginia’s abundant coal supplies. This research is essential for promoting the development of coal-derived fuel facilities, like the $4 billion coal-to-gasoline plant now under construction in Mingo County, to help reduce America’s over-reliance on foreign oil. Where the Administration has given lip service to fossil energy and coal research, and then proposed whacking the budget for it, I pressed hard to restore the funding,” said Rahall. That’s right. Rep. Rahall’s official response to being criticized for being too pro-coal is to issue a statement emphasizing how pro-coal he is. OK … first of all, most experts say that there’s little to any chance that technology like CCS is going to catch on — be perfected and deployed on power plants — unless Congress or the EPA acts to require reductions of and set limits on greenhouse gas emissions. The last I checked, Rep. Rahall is against Congress or the EPA taking any such actions. Second, I’m not sure that anyone who takes the threat of global warming seriously is actually interested in promoting coal-t0-liquids technology, especially if it doesn’t — as with the West Virginia plant that Rep. Rahall is championing — include CCS equipment on the production facility. The House majority voted to keep a Dirty Water Rider in the House’s Energy and Water Appropriations bill, which would expose 60 percent of our country’s streams and at least 20 million acres of wetlands to toxic pollution and threaten the drinking water of 117 million Americans. The Dirty Water Rider was introduced by Rep. Denny Rehberg (R-MT) in an effort to block the Obama administration from protecting waters of the United States, making it easier for polluters to dump their waste into our waters. The Mica-Rahall bill, H.R. 4965, aims to ban federal agencies from restoring water protections under the Clean Water Act, blocking Clean Water Act safeguards for 60 percent of our country’s streams and at least 20 million acres of wetlands. If enacted into law, the bill will threaten the drinking water of 117 million Americans. In an effort to free the critical waters that supply Americans their drinking water from this dirty water bill, Rep. Eleanor Holmes Norton (D-DC) offered an amendment that would exempt those waters from the bill’s ban on restoring coverage under the Clean Water Act. Members of the House committee used a procedural trick to thwart Rep. Norton’s effort to get their vote on clean drinking water. That procedural trick? That was Rep. Rahall. He blocked Rep. Norton’s amendment with a “point of order,” in which he actually argued that drinking water doesn’t really have anything to do with the Clean Water Act. A few notes. First of all I would like to say that it is unfortunate that the action in Rahall’s office in DC just happened to be on the same day that UBB families were paying a visit to capitol hill. Its too bad that the UBB families trip to Washington did not get the same publicity that WV citizens who go to Washington every year to lobby agencies and congress for an end to Mountaintop Removal. The efforts for national reform in mine safety are critical to a better WV, most WV MTR activists fully support these efforts. Despite many WV anti-mountaintop removal organizations supporting responsible underground mining, it is unfortunate that the issues surrounding coal have become so decisive that MTR and mine safety efforts have little coordination. Or maybe its just because its tough for working coal miners to associate MTR activists and organizations for valid fears of loosing their job as raising mine safety issues is bad enough. One would think that Rahall would look a little bit deeper into the issues that his constituents care about. He could be advocating more for actual real reforms of MSHA and mine safety law that would protect miners and prevent any more tragedies remotely close to the horrors of UBB. The water appropriations bill was a perfect opportunity for Rahall to acquire some funding for water line improvements and extensions in his district that encompass several areas where residents don’t have access to safe water or water at all. Is getting more water line projects in his district not a better job creator than funding coal technology projects having no real impact on creating jobs? I guess when there is not chance of getting booted from office under his current WV Coal Association platform he can stay there with out actually having to listen to real people with real needs. Very sad and depressing. Rahall, like all of our West Virginia “leaders,” knows the score: coal is in inevitable decline in Central Appalachia, and we owe it to the citizens in the coalfields to help them prepare for a new economic future. Instead, what do these leaders advocate? More billions in subsidies for coal. I respect and appreciate Ken’s unflinching investigative reporting. I would like to add that those meeting with Rep Rahall were supportive and respectful of the families of UBB miners who were meeting with Rep Rahall earlier that day, giving them the space and time they deserve. In no way does the struggle to end MTR conflict with the struggle for safer mining conditions. In fact, they are part of the same fight, facing similar challenges and opponents. As grateful as we were for Rep Rahall seeing us, his attitude before and throughout the meeting, as Ken describes, demonstrated his unwillingness to listen to a perspective other than the coal industry’s. Further, his inconsistent logic – he intends to block the Clean Water Act, gut the EPA, and support MTR, while simultaneously, he hails the tourism industry that brings people to WV to enjoy the beauty of our state, hike our mountains, and raft our waterways- evidences his lack of understanding of the effects of his actions and a disregard for the future of West Virginia and its people. Not all of us “young activists” (whose ages range from 19-66 and all of whom are West Virginians), who met with Rep Rahall came with the intention of getting arrested. Had the meeting gone differently, perhaps we all could have left with a better understanding of each other’s perspectives and a foundation for moving forward to guarantee all West Virginians have access to clean water and to ensure the state’s economic future.